The picture on the right is the HP tube which corresponds to the electron gun shown on the 'electron gun' page. This Tektronix Analogue storage tube has the same gun assembly as shown on the electron gun page. Part Number 154-0682-12. 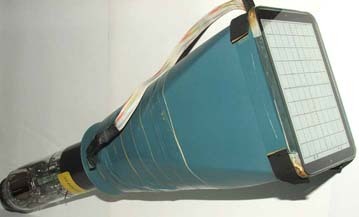 The ribbon cable seen in the picture connects to the flood guns which are fitted inside the blue painted ceramic cone. 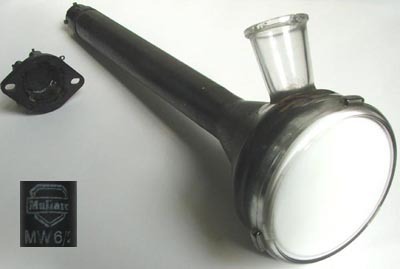 The glass neck and face-plate are bonded to the cone. On the right is a Sylvanian SC251A tube. This appears to be quite an old tube from its construction. It was possibly used in an early oscilloscope. This tube is also quite old and likely to originate from WWII radar military equipment. The next CRT shown in Image 5 is a small Telefunken tube with trace rotation coils fixed to the neck and an internal graticule. Image 6 shows a large Dumont tube with a dual gun assembly and a long persistence green phosphor. Its packaging is dated 1951 and the tube part number is CDU 5SP7. 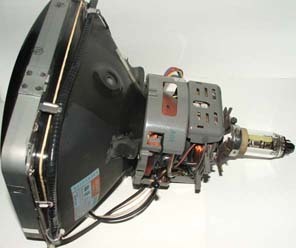 The small Trinitron tube on the right is complete with its scanning coils assembly and degauss coils. It was originally used as a monitor in an Apple computer. This even smaller monochrome monitor CRT, shown in Image 8, is from a digital storage scope. With the introduction of digital storage scopes, raster scanning monitors have been used to display traces. The Mullard CRT here is from a projector television. Surprisingly, it dates from the 1950s. The black and white image produced on the screen was optically projected onto a 21 inch screen. 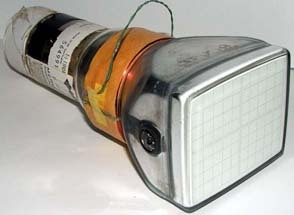 The clear glass flange on the side of the tube protects the anode connection. This tube operated with an anode voltage of 25kV which was higher than other tubes at this time. 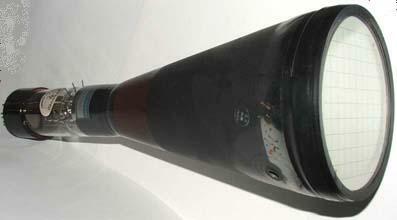 The final picture, Image 10, is of a red phosphor projector tube from a colour projector. Tube type:- Mitsubishi VT0705B22(R). 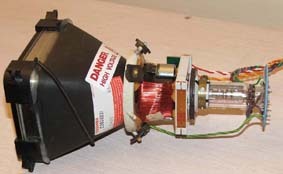 This tube uses an external magnetic field coil assembly to focus the beam as well as the usual deflection yoke.